You know the cute little flag thingys that you see everywhere and are just so cute? Last night I was thinking about them, and I thought that if I turned the flags upside-down that they would look like Christmas trees! Do they look like trees? Or does it just look like I put them on the wrong way? I can't decide. But either way, I kinda like them! 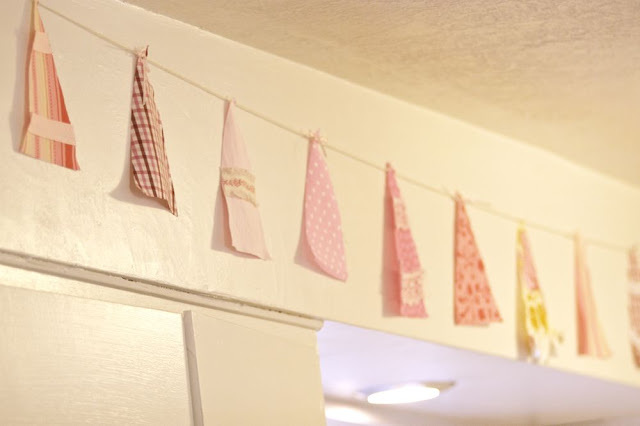 I decided to use pink fabrics, with ribbon and lace as "tree" garlands. I love pink! And it matched my kitchen beautifully I think! I would also just like to add that today is the greatest! You know when everything just feels happy? 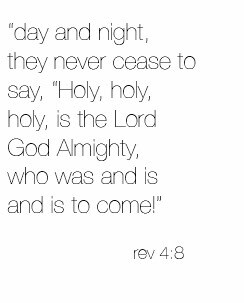 That's today! Happy Tuesday!! glad you're having such a "happy" day! 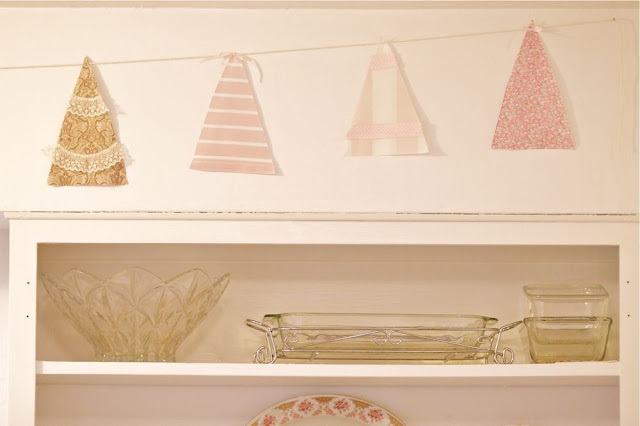 Oh - I love it ~ It's adorable and look fabulously shabby chic in your kitchen! Happy Holidays! Hee hee, how cute are those! They totally look like Christmas trees. Love the tree flag garland. It's so pretty. Love the pink kitchen too. As I was looking at your blog post with Pear on my lap she said to me "I want our house to be prettier than that one because ours isn't prettier." You gotta love 2 year olds! They tell it like it is! Love the garland! Very cute and I think they pass as Christmas trees. Also, I too think your kitchen is gorgeous and some day when we're done remodeling maybe ours will be pretty too! 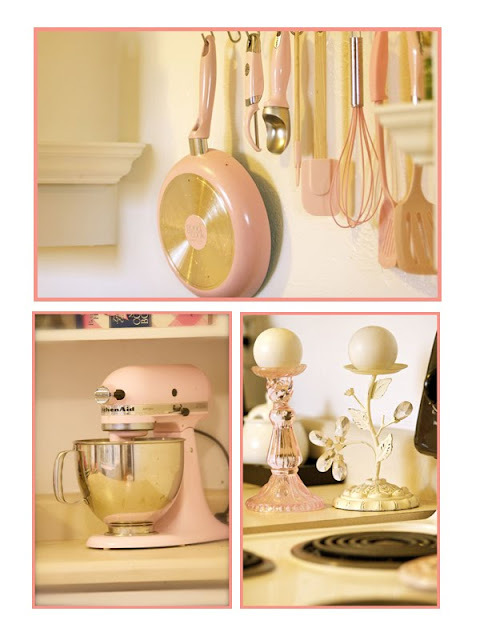 Your pink kitchen is to die for!!! I love it! And I personally love the upside down trees.. That might work for my kids study room to add a subtle bit of cheer! Thanks for sharing! I just want to say that I think it is awesome that you have a PINK kitchenaid mixer...i love it! I love the pink kitchen. And the pink kitchen aid. WAY FUN. My husband would never let me get away with that. 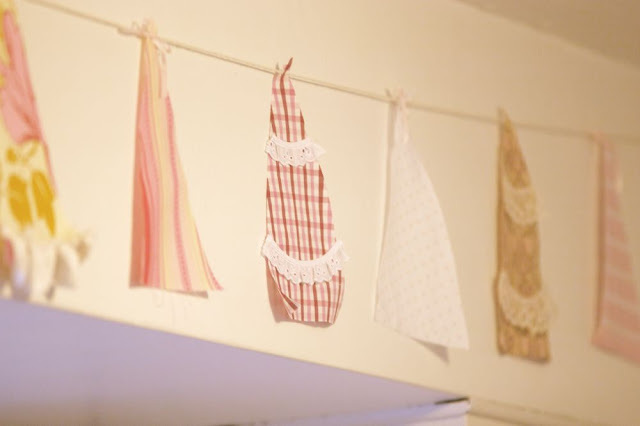 i love your kitchen AND the garland. I think having the ribbon and lace on there makes it look like trees for sure. Soooo pretty, all of it! 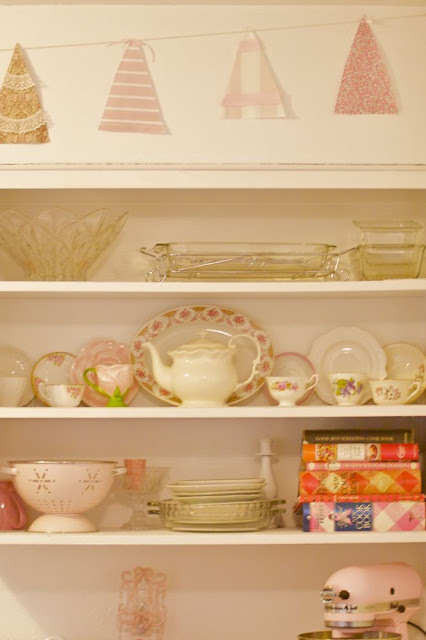 I am in love with your pink kitchen! I'm trying to get my booty in gear to snaz up my daughters room! Your little girls was so whimsical and fun! I was going to comment on the pink kitchen aid also! Where did you find it?? Mine is 70's gold :-( but i still love it! I never think of 'pink' at Christmas, but I begin to love "pink" for you. Thank you and have a great,great day!! I got my mixer as a wedding gift from my mother and grandmother. I think they ordered in online through Macy's, but most stores that carry KitchenAid can get you one in just about any color you like! I love mine to death! I just discovered your blog and I really really love it--you're so very inspiring. I've been scrolling through your posts like crazy! Thanks for all the tutorials. First let me introduce myself...LOL..sounds like spam huh? No, I'm visiting you cause you visted me on my SITS FB day and I vowed to return the favor..>WHEW it's been a while. Second, is your name really Disney? THIRD, I LOVE LOVE LOVE LOVE, did I say LOVE your kitchen. It's perfect. adn the trees are too cute! Fourthly, how did you make the purse? Oh, hi Michelle! Well thank you for returning the favor! Yes, Disney is my real name! And I made the bag (I think you're talking about the one below?) by sewing up the bottom of a tube top, pleating it, and adding straps from the underlining. Then I made rosettes from scrap pink jersey! I am jealous of your kitchen! LOVE all the pink! And the Christmas Tree flags are lovely. What a GORGEOUS KITCHEN!!! Oh, jealousy! I think with embellishments they are more recobnizable as Christmas trees. Very cute! Pink makes me happy too! Hi Disney! I've been keeping up with your blog for about a month now and I've even made a few things from your tutorials! 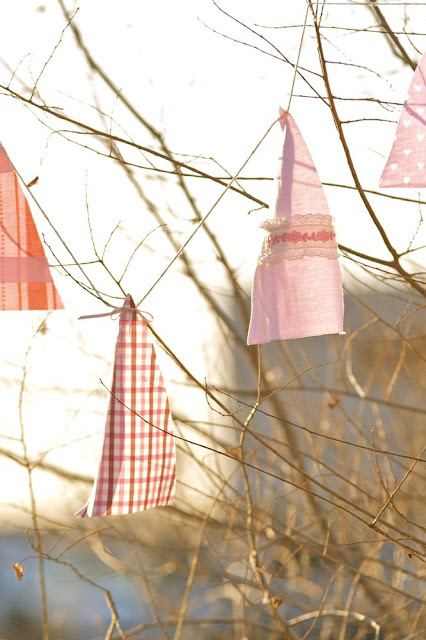 I wanted to tell you that your pink tree flags are adorable, I'd never thought about making any flags before. I think I'll try it, but maybe use the pinking shears on the edges to evoke more of the tree theme.... do you think that'd make them feel more tree-like to you? Thanks for all the great ideas. My daughter would thank you on Christmas day if she could, she's reaping the benefits of your uber-creative blog!